Fortunato was named to the Pro Bowl five times and NFL All Pro three times. 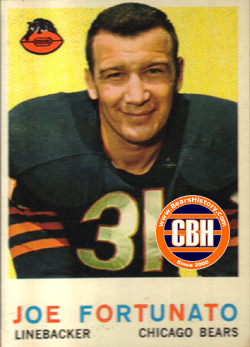 He played outside linebacker for the Bears from 1955-1966 until he was supplanted in the lineup by Doug Buffone. Fortunato was a member of one of the greatest linebacking groups in NFL history when he teamed with Larry Morris and Bill George, who played together in the 1963 NFL Championship season. Fortunato was named as one of the 300 best NFL players of all time. He also served as an assistant coach on Jim Dooley's staff in 1967 and 1968.